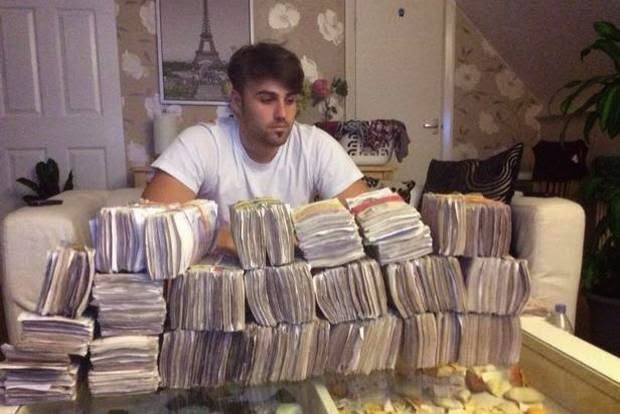 A drug dealer who snapped pictures of himself surrounded by £250,000 in cash has been jailed. Olsi Beheluli, 24, ran a drugs operation with heroin and cocaine worth an estimated £4million. National Crime Agency officers found a picture of him surrounded by piles of cash on his iPhone after raids in north-west London. Beheluli, along with his associates Besim Topalli, 29, and Azem Proshka, 23, used a "stash house" in Neasden, where counterfeit identity documents and scales were also found. Officers also recovered powdered caffeine and paracetemol which were to be used as cutting agents for drugs. Beheluli, form Harrow, was found guilty of conspiring to supply class A drugs at Blackfriars Crown Court and was sentenced to 11 years in prison on Wednesday. His Albanian associates Proshka and Topalli were sentenced to 10 years each after they admitted conspiring to supply drugs, money laundering and false ID documents. They will be deported after serving their sentences. National Crime Agency branch commander Oliver Higgins said:“Beheluli seemed to enjoy the high life and gambling with the money he made from drug dealing, but in the end his luck run out. “These men were involved in supplying significant quantities of high-purity class A drugs, as demonstrated by the value of the cash, cocaine and heroin we have seized from them. “But they were unaware that they were being watched by the NCA, and their arrest and subsequent conviction should have the wider criminal fraternity looking over their shoulders.